Be yourself, build relationships, stay focused, and use your crock pot — that’s just some of the advice dished up by honorees at the 2012 Women of Western Wake Luncheon, to a sellout crowd at Cary Magazine’s latest live event. 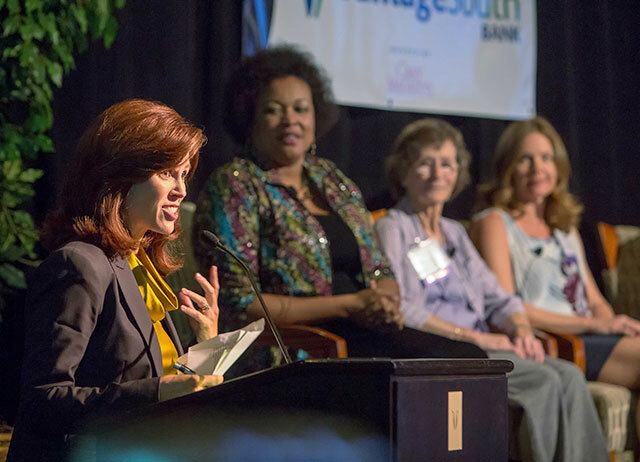 The Women of Western Wake Luncheon, hosted annually by Cary Magazine, is a celebration honoring the achievements and successes of female leaders who make a strong impact on our community. Juliann Zoetmulder, founder and president of the Western Wake Farmers’ Market. This fifth-annual event was held this year on Oct. 19 at The Umstead Hotel & Spa. The day included a networking session, delicious lunch, and a panel discussion with honorees moderated by ABC 11 TV’s Angela Hampton. Among the buzz of conversation across The Umstead ballroom were hugs and greetings exchanged by friends old and new, who joined to celebrate the special role of women in the home, workplace and community. For others on the panel, success is inspired by striving to be their best, helping clients succeed, and making daily progress toward their goals. The panel also discussed issues affecting women in the workplace, including equal pay. The panel encouraged the women, and a few men, in the audience to build supportive relationships. Burns credited positive rapport with others in the business community for helping to launch her firm and build a strong client base. So is it possible to “have it all?” This question from Hampton elicited humorous responses from the panel among the serious notes. Brown said yes to the have-it-all question: “You can, but you have to believe that,” while Struffolino said the balancing act women face in juggling children, work and community is “just another growth component” in our lives. The Women of Western Wake shared the bits of advice they’ve received that has made a difference along the way. These pearls of wisdom brought much head-nodding among the audience. “My grandmother always said, ‘Good, bad or indifferent, you’re judged by the company you keep,” began Struffolino. A co-worker approaching retirement told Burns early on to, “‘be nice to people on the way up; you may meet them again on the way down,’” she said. Along with the advice of others, the honorees also had wisdom of their own to pass along, things learned via years of hard-earned success. Stay focused, Burns recommended, and seek a mentor in your field to build long-term relationships. Finally, the panel offered its thoughts on the traits and qualities of a great female leader, in a question proposed by a member of the audience. Be a great listener, Zoetmulder said. Be fearless and take risks, Brown said. Be humble, Burns said. And for Struffolino, leadership is in how you treat other people. Congratulations again to the 2012 Women of Western Wake! Cary Magazine’s next live event is the Elegant Weddings Gala, set for March 2013. Keep watch here for more details.